Breakfast is the most important meal of the day, right? Before Lucia, I subscribed to a much more relaxed version of that: coffee as breakfast, maybe a snack at the office by 10:30am (maybe not), but definitely, most definitely lunch. Now that we have to get Lucia to school in the morning, we’re much better at breakfast (as it was intended). 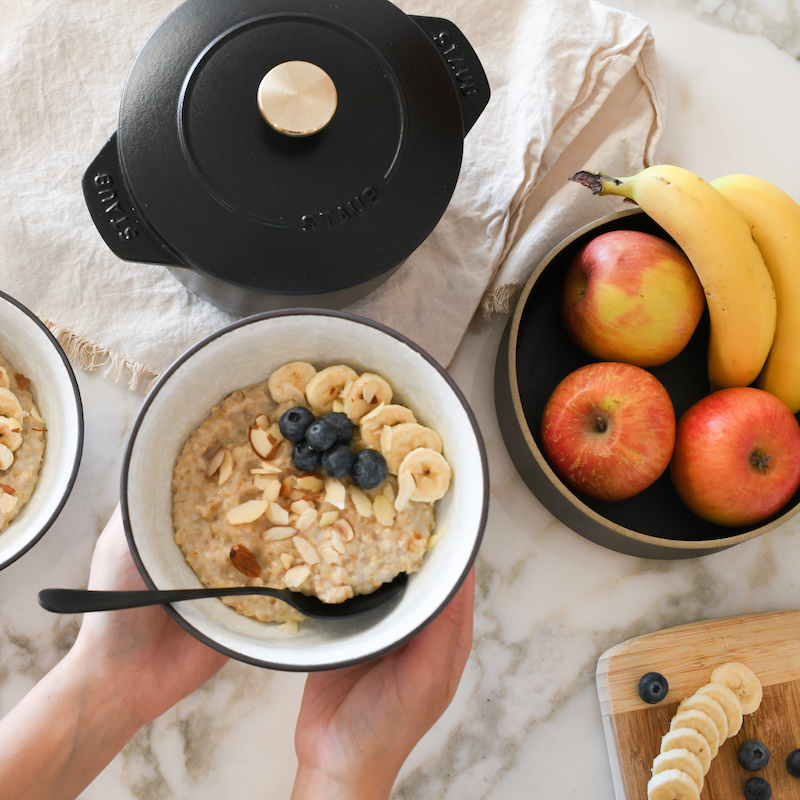 Lucia and I have a hands-down favorite: steel cut oats. To some, like my husband, oatmeal was something you were given every morning as a kid. But as a child of immigrants from Vietnam (I’m proudly first-generation Vietnamese-American! ), I’m not even sure my parents knew what oatmeal was while I was growing up. Making up for lost time, I guess, and I’m so glad Lucia loves it too. 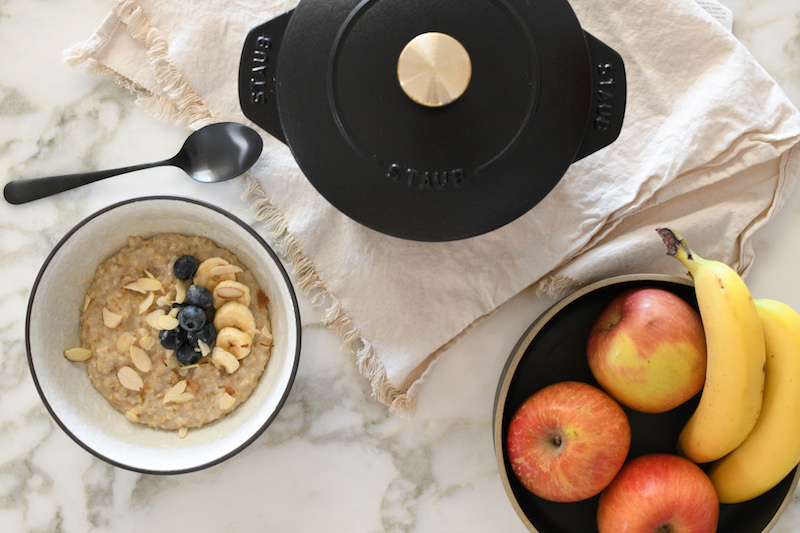 I took advantage of the ongoing kitchen sale at eBay for a new Staub Cast Iron Petite 1.5qt French Oven for our special oatmeal breakfasts. Did you know that 81% of all merchandise sold on eBay is new and available with the “Buy It Now” option? It’s a great match for my impulsive ways (especially with kitchenware now that I’m cooking so often!). And I’m always a deal hunter, making eBay a go-to in my search. But back to this cute little Petite French Oven: it is the perfect size for the two of us and cooks the oatmeal perfectly. Making good habits with Lucia – and as funny as it is, we have her to thank for it! Happy Friday and hope you have a wonderful weekend! Thank you for stopping by and thank you eBay for partnering with me on this post! Your dotted dress is perfect! Just the cutest polkadots look for the weekend! Love ♥️it! Oh yes, me and my daughter love our oats in the morning! You are looking so beautiful and classy in this outfit! As the child of English immigrants oatmeal was our daily breakie! I love the polkadots , I like fun fashion and polkadots are always fun . 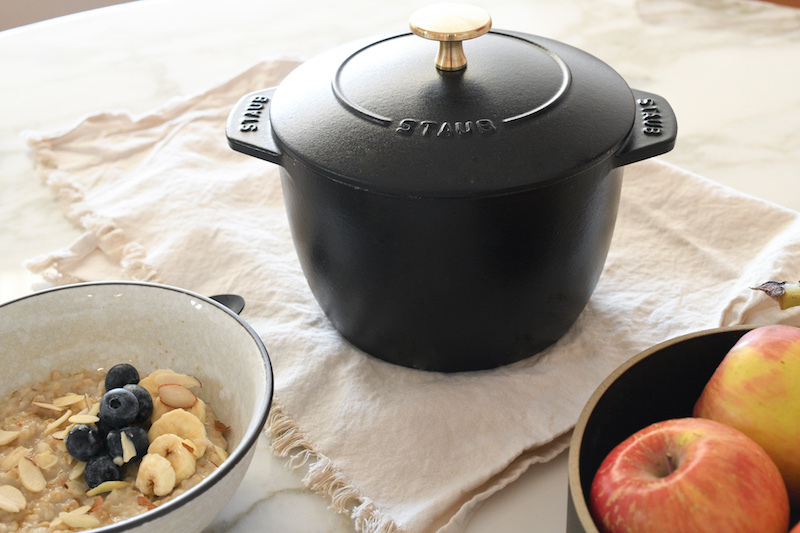 I only make my oatmeal in the microwave, I wish I had a one of those cast iron pots! Its such a win when kids love healthy choices! 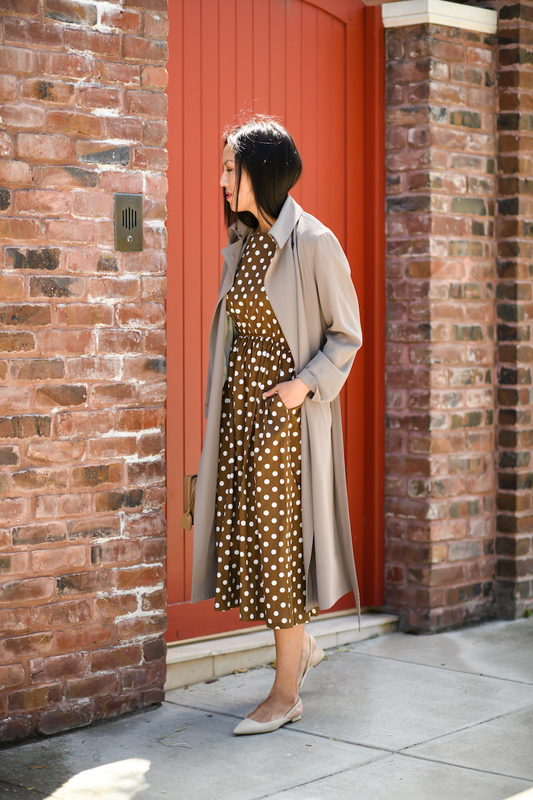 Such a fan of polka dot dresses right now. Great choice! yes, i know that “81% of all merchandise sold on eBay is new “. how do i know that? well, because they advertise that….how do you know that? if this was a sponsored post, please label it as such….